NEXT | Does your guild have any special traditions for Winter Veil? I’m not a diehard battle pet collector but when someone said a rare battle pet was up in Waycrest Manor, I rallied the guild and we headed over there to check it out. Honestly, the image I saw originally does not do the Vengeful Chicken justice. This is a mechanical pet so it occasionally shoot sparks and smoke and it’s clearly something Dr. Oglethorpe in Booty Bay created — if you know about his OOX homing robots. You can get this very rare battle pet in Waycrest right now. It’s from the World Quest: Witchy Kitchen. It will only run for the next three days so don’t delay! To get it, you’ll need to run Waycrest Manor. You can do this on any difficulty. If you have a high ilevel, you might want to do it on mythic so you don’t kill the mobs you need to keep alive. One guild group reported you can still get the quest if you die and have to run back. 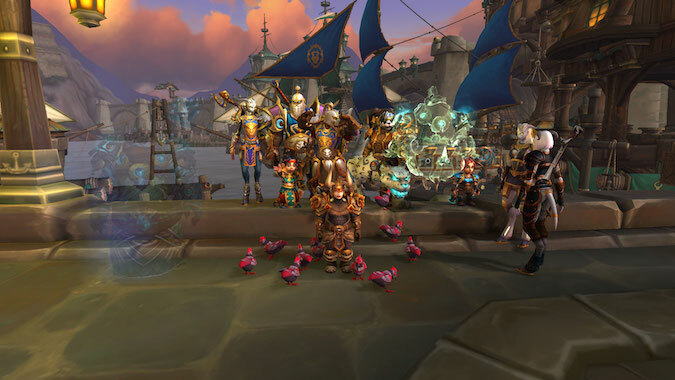 The other guild groups had the tanks simply allow the mobs to beat on them while we waited for the events to unfold. You need to go into the kitchen which is located off Raal the Gluttonous. Then have your tank grab and hold Executive Chef Daniel, Roast Chef Rhonda, and Saucier Samuel. I recommend putting an icon over them so players know which ones they are. We had a witch spawn in the kitchen too while we were waiting for the next steps. The witch can be dps’d down as long as you only target it. The chefs need to create a fire, summon a chicken, and roast said chicken. Once it turns into a roasted chicken, the body gets a ! over it. Everyone in the party who wants the chicken needs to click on the body to get the quest. If you are helping others and already have it you won’t see the ! but everyone else can get the quest. You’ll get an Intact Chicken Brain which you need to turn in to Dr. Oglethorpe in Booty Bay to claim your Vengeful Chicken. You can finish running Waycrest or head straight to Booty Bay. If you are horde, you can — at level 120 — queue for Waycrest or, if you are a lower level, run over there and run the dungeon. For those of you hated by Booty Bay guards, there’s not a lot you can do other than run this dungeon on a non-hated toon or try to do a turn in while someone else who is hated draws the guard’s fire. Dr. Oglethorpe can be difficult to find. He’s on the upper level near the crook in the walkway at the southeast corner of Booty Bay. You’re looking for Oglethorpe Obnoticus on the sign. We were a bit nervous trying to get this because of the need to not kill the kitchen staff. Just watch for the witch and try to pull her away from the staff to be killed. You need to be patient while the staff does their thing. I think it took a couple minutes for the sparkling chicken body to appear with the ! over it. Before you kill any mobs, make sure everyone who wants the chicken has accepted the quest. Happy chicken hunting! Update: You don’t have to complete the dungeon to get your Vengeful Chicken. Have fun storming the manor, regardless.